The Premier League champions are level on points with Swansea heading into Sunday's relegation battle at the Liberty Stadium. Clement thinks Ranieri deserves better, even if he has received a vote of confidence this week. "What he did last year was remarkable and for that he deserves time to try and put it right," Clement said. Clement thinks speculation on Ranieri's future is unfair. ''How he is public enemy number one? I just don't understand that,'' said Clement. 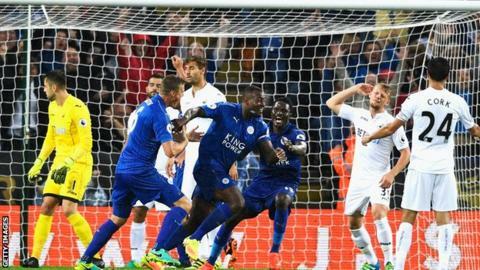 "The talk of unrest and players speaking to the chairman and pundits talking about who might be next Leicester boss is not right," he said. "He is a very good coach, tactically very good, did amazingly well with that group, got them so tough during that run-in when everyone thought they would fall away and they kept winning 1-0, 1-0, 1-0. He deserves a chance to turn it around." Clement had mixed news for Swansea fans regarding team selection for the weekend. Ghana striker Jordan Ayew arrived has at Swansea this week after international duty at the African Cup of Nations. And Clement has made it clear Ayew, signed from Aston Villa in January in a player plus cash deal which saw Wales full back Neil Taylor go the other way, is in contention for a debut. Clement says Ki (knee) is out for a few more weeks and admits Swansea are now light in midfield. "It is possible he could be a couple more weeks away, he has had specialist opinion on his knee, he will have more advice and go from there," added Clement. "It is not a long term injury, I am hoping it will be three to four weeks and we see him back again. "But with Leon out, it does not leave us with a lot of depth in midfield and we need to keep the guys who have been doing well fit." Clement also revealed that long-term injury victim Jefferson Montero will be out for three months with a torn hamstring.